Tree climbing is a risky play activity that has many benefits for the developing child. Kids love the challenge of climbing trees. 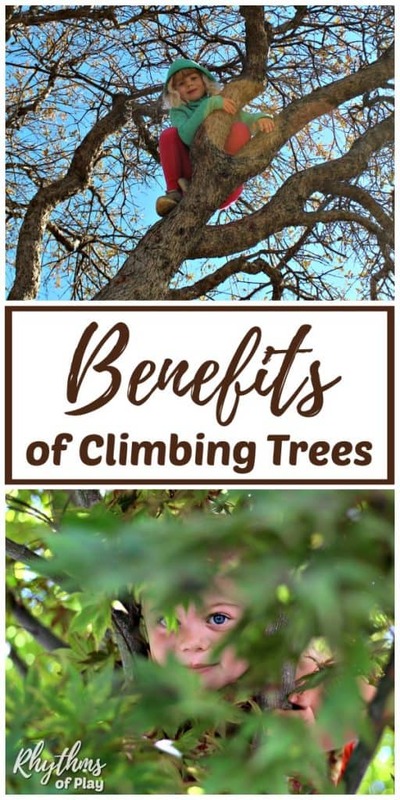 Learn 15 reasons to climb a tree, how to support your children as they climb trees, how to climb a tree, the benefits of climbing trees and other important benefits of risky play for children. I spent my childhood engaging in risky play activities, such as climbing trees, with my 3 brothers. When I was a child, I felt the benefits of these risk-taking activities cumulate in a sense of strength and confidence. As an early childhood educator and junior lifeguard instructor, I encouraged and supported the children in my care to take manageable risks, so that they too, could learn to trust themselves as I had. Now that I am a parent, I strive to encourage and support risky play activities to help my child develop and grow into a well rounded human being that is in touch with her strength, her limitations, and her sense of self. Tree climbing is a risky play activity that has many benefits for the developing child. We hope you agree that the thrill of climbing trees and its benefits far outweigh the fear of climbing trees and its inherent risks. Climbing trees can help develop physical strength. Tree climbing helps develop focus and concentration. Climbing trees can boost self-confidence and self-esteem. Tree climbing is an excellent gross motor activity for physical development. Climbing trees can help children become more flexible in body and mind. When you climb trees you form new more complex neural networks in the brain. Tree climbing helps develop a resilient “I can do it” attitude. 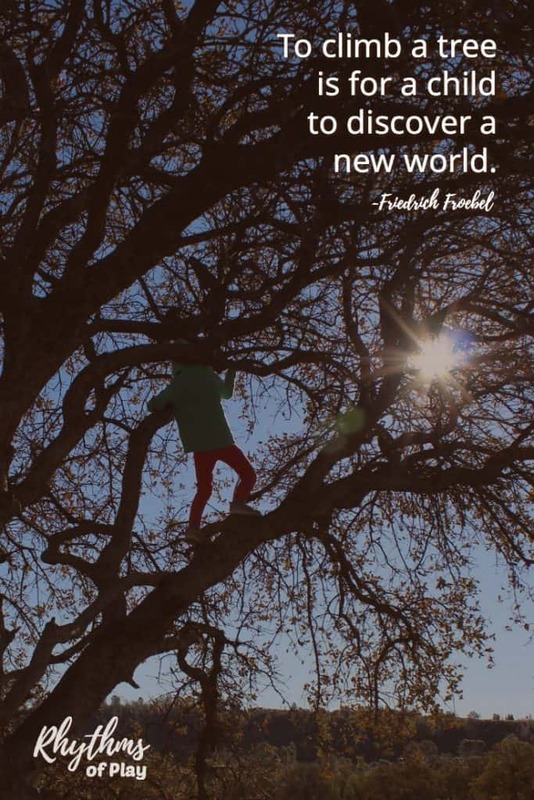 Climbing trees helps children become problem solvers. Tree climbing helps us develop a better connection with ourselves. 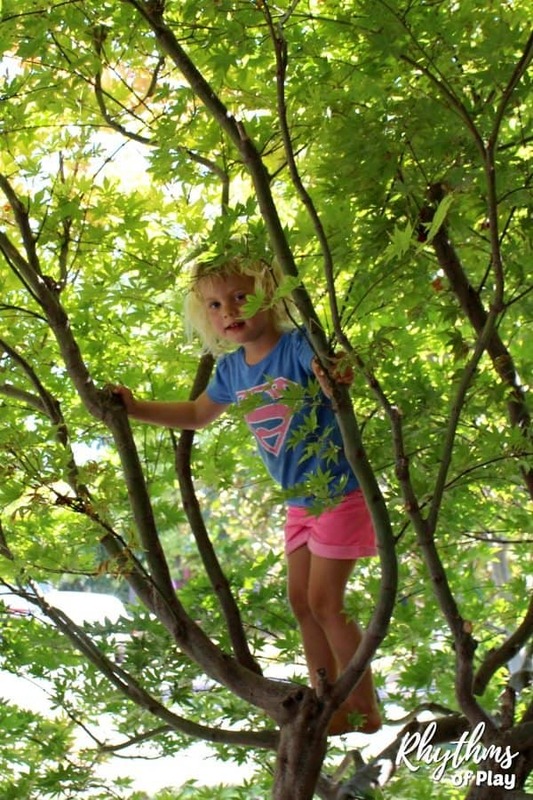 Climbing trees provides a rich sensory experience for the developing child. Tree climbing helps us learn to think for ourselves and feel confident about the choices we make. Climbing a tree can help develop strong spatial reasoning skills. Tree climbing is a great way to strengthen the mind and the will. Climbing trees helps us connect with nature. When your child starts trying to climb trees this is usually an indication of readiness. Invite or encourage your children to start with small “easy” trees to climb and progress as they gain mastery. Support your child’s first efforts, then step back and allow them to do it on their own. If ever YOU feel unsafe about your child calmly ask, “Do you feel safe?” If they do not feel safe assist them as calmly as possible. When nerves get rattled is when we make mistakes. 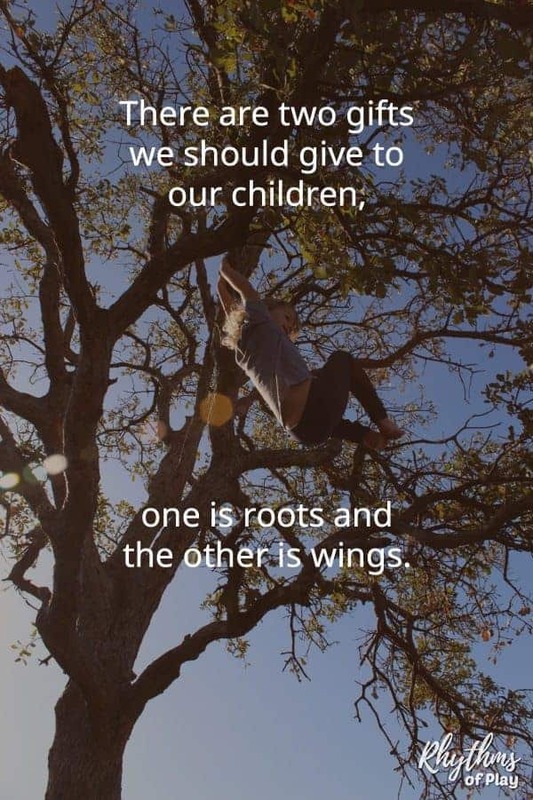 Asking a child if they feel safe when we feel unsafe helps us all feel a lot better whether our children are just learning to climb, or 40 feet up a tree! Can you find my daughter in the tree below? Don’t worry… It took me a minute too! As I was sweeping the porch one day I looked up in search of my daughter. 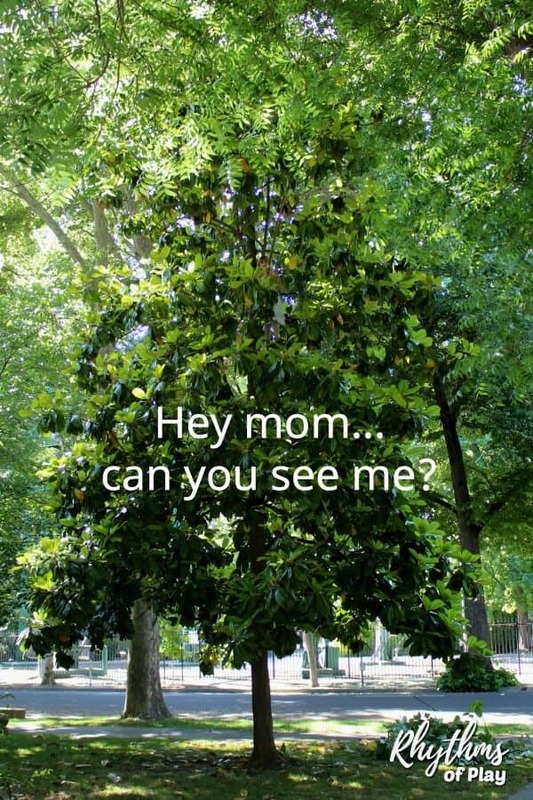 She must have been watching me because I soon heard, “Hey mom… can you see me? Wait until your child shows that they are ready to climb a tree. Don’t ever push, force, or cajole a child to climb a tree. Start with small “easy” trees to climb and progress as your child gains mastery. Support and guide your child. Once they gain a little confidence you can allow your child to do it on their own. Hands and arms are for grabbing and guiding while feet and legs are for pushing and climbing. Encourage your child to always have at least one “strong hold”. Meaning, always have one hand or foot positioned in a way that helps your child feel safe and secure in the tree. Tell your child not to move or climb higher unless they feel safe and secure. Practice climbing down, before climbing higher. Getting down is always harder! Get out of the way. There comes a point when every parent needs to trust their child to do it on their own. Step back and bask in the development of your child’s growing self-confidence. Whenever you feel unsafe about your child calmly ask, “Do you feel safe?” Help if needed. The first tree my daughter was able to climb was a small Japanese Maple Tree that was in our front yard at the time. She would stand at the bottom of it, arms reaching upward, and cry out in frustration until the day she finally figured out how to climb up into it. Whenever she would ask for my help I would calmly say, “If you can’t get up there yourself you’re not ready to climb it yet.” I could see in her movements (I have a BS in Kinesiology) that she was not ready, and if I helped her I would be hindering her from learning how to do it on her own. Finally, the day came that she figured out how to get up the first section with only minimal guidance from me. I stayed close and offered my support as needed until it became visible that she was gaining comfort and confidence in the tree moving around. At that point, I sat down and took pictures. Just look at her smiling face… Sweet success for both mother and child. There is nothing more rewarding than watching your child develop mastery and gain confidence on their own. The photo above was taken the moment after my daughter climbed this tree for the very first time–and I felt comfortable enough to step back and take a photo. “Look Mom! I made it to the top.” The photo below was taken the next day. Mastery complete – of this small tree anyway – the hardest part about climbing trees is getting back down! 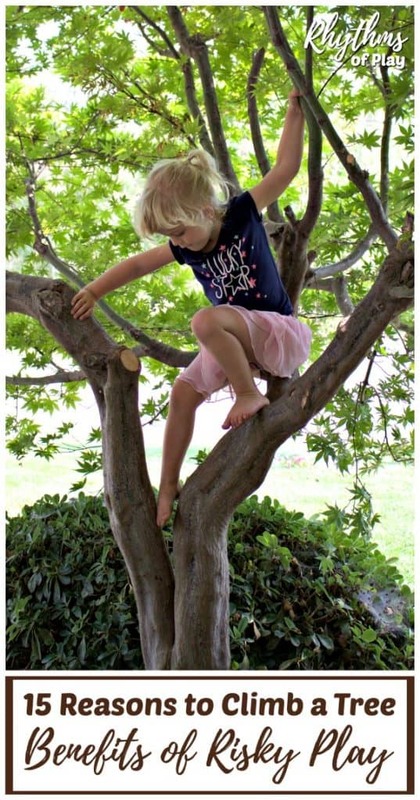 Tree climbing is a risky play activity that has many benefits for the developing child. Kids love the challenge of climbing trees. The physical challenge creates a boost to a child’s self-esteem and the feeling of accomplishment. There is also a mental challenge to climbing trees. Focusing on “solving the problem” of how to get up the tree creates a resilient “I can do it” attitude when faced with both mental and physical problems in the future. Risky play activities such as climbing trees, walking across logs and fallen trees, and bouldering can be dangerous, but there are many benefits to children that engage in risky play. Daily small manageable risks add up to big gains in a child’s self-esteem and self-confidence over time. Taking risks in play is essential for children’s growth and development. Risky play can help children learn their strengths and weaknesses and become more aware of their limitations so that they can learn to take care of themselves. You may also like this amazing collection of outdoor learning ideas and nature activities, and our summer bucket list. Learn more about Rhythms of Play. This is great, Nell. My girls love everything that has to do with trees – climbing them, hanging from the limbs, crawling across logs on the ground – and my youngest frequently wears a tutu!